In the course of our daily lives we sometimes forget that the wisdom of the past, whether a poem, a saying or a story, can often illuminate the very universal moments we are living in. 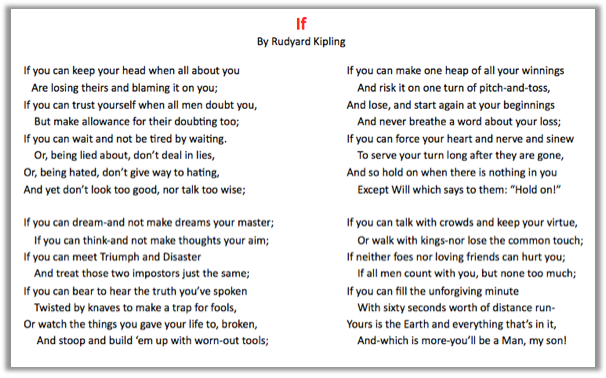 We rediscovered this famous poem and felt it was worthy of sharing and certainly applicable to today’s fast paced world. We encourage our readers to pause in their daily life and reflect on the very meaning of their situation. We’ve found that often a brief respite, a breather of sorts, from our busy schedules allows us to Be Comfortable in Your Own Skin. Poems can make us more mindful so we share the poem If with that in mind…Enjoy!